I was hoping to write something interesting about my visit to Business Travel Market 2012 at the Excel Centre in London, but I can’t. This show just gets worse every year, both in terms of the number of stands and the quality. It is telling that BA, which was a Founding Partner of the show when it launched three years ago (and is still listed as such on the website) doesn’t even bother to exhibit anymore. 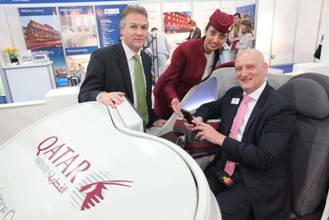 There was only one airline seat on display – the new Qatar J seat for the 787. And very impressive it looked too …. from a distance. They had put the seat in the Hosted Buyers Lounge, which meant I couldn’t get access to it – as I live in London, I didn’t bother signing up for the Hoster Buyer programme which helps pay for your travel and hotel costs to the show. Here is a PR photo from the show, which is the best I can bring you! The Business Travel Show at Earls Court in February has also been shrinking in recent years (both in terms of number of days and number of exhibitors) but you can usually count on that for a decent smattering of seats to try out and good competitions! Really, though, the two sets of organisers should merge the shows ASAP before both fade into irrelevance.